Pietra dura, micromosaic, and mosaic jewelry all originated in Italy, but they can be confusing to both antique collectors and dealers alike. In fact, they're very often misidentified in online listings where these items are being sold. All three of these types of Italian jewelry use inlaid construction, yes, but they’re actually very different when you examine them closely. They are, however, distinctive and easy to recognize once you understand the differences in each style. This type of antique jewelry developed during the 16th century in Florence, Italy can be confused with micromosaic jewelry made later on, since it does use a similar technique of inlaying stone into a background to form a picture and they were set into similar styles of simple frames in many instances. However, pietra dura (translated as “hard stone” in Italian) designs were made using larger and fewer pieces of stone in comparison to the tiny pieces making up intricate micromosaics. The components in pietra dura designs are actually polished and thinly sliced pieces of stone – most often semi-precious like agate, lapis lazuli, jasper, and chalcedony – placed into a dark background sometimes consisting of black marble. These pieces usually feature foliage or floral motifs, so other subject matters would be considered rare. These should not be confused with piqué pieces, which were made of tortoiseshell inlaid with metal and/or mother of pearl. Using very small pieces of glass or stone, referred to as tesserae, micromosaics form small pictures that might be mistaken for paintings at first glance. This technique was perfected in the Vatican Mosaic Workshop in Rome, Italy in the late 18th century. Many of these pieces were sold as souvenirs and they will depict ancient Italian landmarks. Other themes such as animals or birds can be found as well. Quality varies in these pieces and those with those exhibiting the finest detailing and craftsmanship being, of course, the most valuable. A good number of these are set in karat gold frames. Lesser quality mosaic jewelry (read more below) set in non-precious metal is often erroneously identified as micromosaic or micro mosaic. 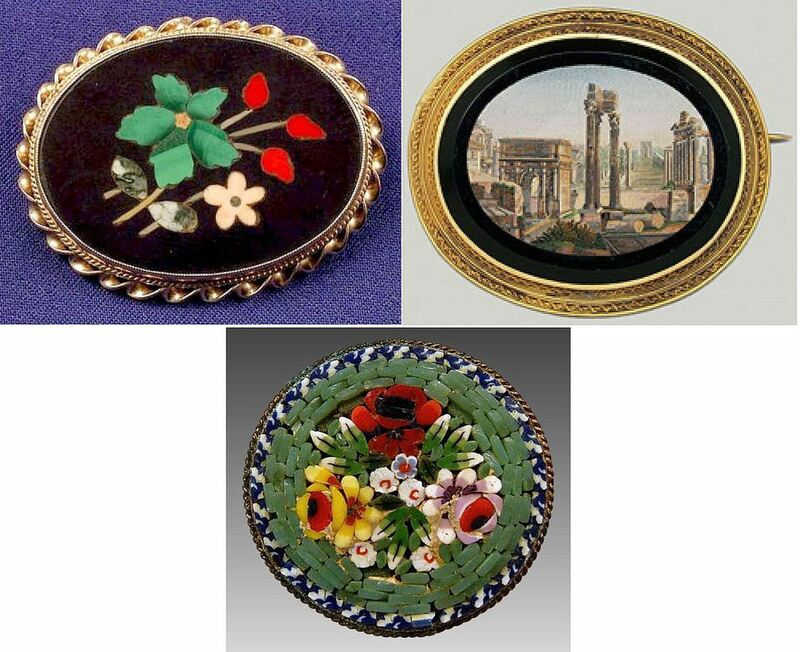 These Italian souvenir pieces were made later than antique pietra dura and micromosaic pieces. They can date back as far as the late-Victorian era. The older examples fasten with a simple “C” clasp with no safety mechanism, but even the older examples are far more common than true micromosaic pieces described above. Quality varies from very crude to nicely constructed, although they will never be confused with a miniature painting like a micromosaic might since they are very obviously made of bits of glass. These were made using larger, chunky, colorful pieces of glass set into non-precious metal frames in most instances. While they clearly don’t have the same level of intricacy, many sellers erroneously market these as micromosaics or micro mosaics (likely using two words to garner the most search results in item listings). Most found today are mid-century tourist pieces, and the pin backs fasten with rollover safety catches or inexpensive safety pin type closures. They are often marked “Made in Italy” or “Italy” on the back of the frame. While collectible, they are not highly valuable unless they are early non-floral designs or unusually shaped. Pamela Y. Wiggins is the author of Warman's Costume Jewelry (Krause Publications, 2014).